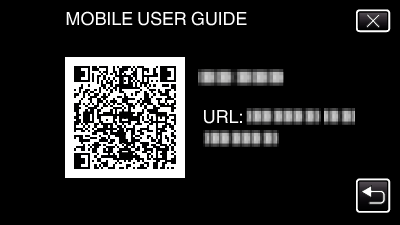 Displays the QR code to access the Mobile User Guide. The portal site appears when the QR code has been read correctly. Select the model name of your camera to display its Mobile User Guide. To read the QR code, a relevant application is required. Enter the URL in the internet browser manually if the QR code cannot be read. The Mobile User Guide is supported by Android devices and iPhone. You can view it on standard browsers such as Google Chrome (Android) and Mobile Safari (iPhone). Sets the brightness automatically to “4” when using outdoors and to “3” when using indoors. Brightens the backlight of the monitor regardless of the surrounding conditions. Sets to the standard brightness. Darkens the backlight of the monitor regardless of the surrounding conditions. Helps to save battery life when selected. Turns on or off the operation sound. Turns off the operation sound. Turns on the operation sound. Prevents the situation of forgetting to turn off the power when this is set. Power is not turned off even if this unit is not operated for 5 minutes. When using battery, power is turned off automatically if this unit is not operated for 5 minutes. Launches this unit immediately by turning on the power within 5 minutes after the power is turned off. Adjusts the response position of the buttons on the touch screen. Updates the functions of this unit to the latest version. For details, refer to the JVC homepage.